Hanoi to Mai Chau. 10 Secret Tips To Know Before Making The Trip. You are in Vietnam, and after a few days of busy sightseeing in Hanoi, you wish to visit the remote mountain town of Mai Chau. Getting from Hanoi to Mai Chau is easy. Follow our lead and ignore anyone who tells you otherwise. We took our two kids to Mai Chau, stayed in a stilt house and had a ball. 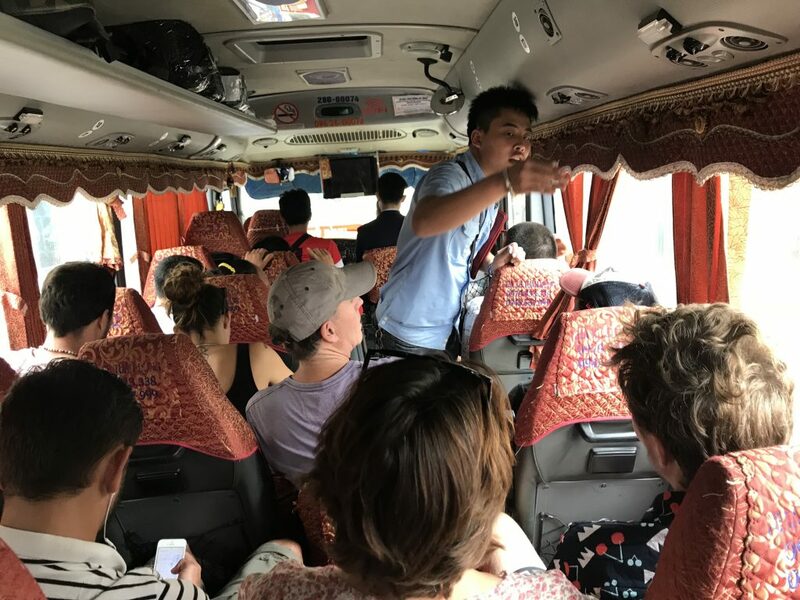 But, there were a few things I wish someone writing a Vietnam travel blog had told me about; especially about what to expect when you get the local bus! The distance between Mai Chau and Hanoi is approximately 140 kilometres. But the roads are squiggly and so the journey (on a bus) takes around three and a half hours. 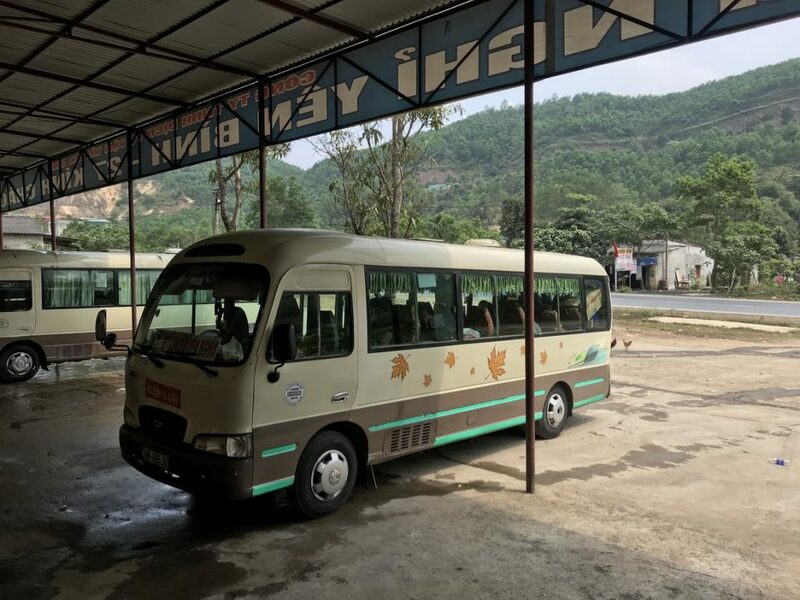 It’s too far to go for a day trip from Hanoi to Mai Chau, you’d be spending most of your day on the bus and you don’t want to do that. trust me. Anyway, there are lots of things to do in Mai Chau so you don’t want to rush. At the end of this post is a video for you to see just how beautiful Mai Chau is, but you must read what I have to say first. Promise? So, Why Do You Want to go to Mai Chau? You have seen images of the countryside, and it looks idyllic. Sleeping in a homestay stilt house sounds romantic and authentic. You want to get away from tourists and crowds. You want to get back to nature. You want to experience homecooked Vietnamese food. Am I on the right track? Are you and me on the same page? Good. The great news is is that all of these things are true and you will get what you wanted when you visit this sleepy little town in Northen Vietnam. But. There is something else you need to know about Mai Chau. Something significant. I’ll tell you about it later in this blog post. Please assume that this post contains affiliate links. They cost you nothing but we make a small commission. 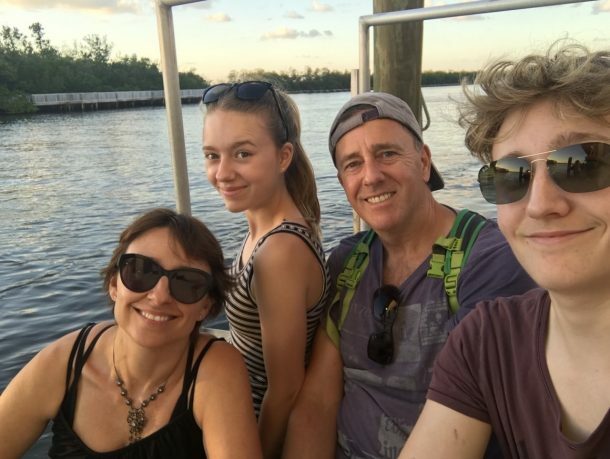 We are travelling around the world for a year with our two teenagers. I was desperate to experience all of the above with them, so we decided that to go to Mai Chau for four days would be perfect. How To Get To Mai Chau From Hanoi 2019. If you are travelling throughout Vietnam then I suggest you use the same booking agent that we used. As there is no train or plane going to Mai Chau, you have the following choices. If you have the funds (unlike us) taking a tour has got to be one of the easiest ways to see the sleepy village of Mai Chau. If you want to relax and let someone else take the stress out of the planning (even though it’s really very straightforward!) then take one of these fabulous tours. We have used them in the past and they are the most reputable company out there for guided tours. Bus Schedule From Hanoi to Mai Chau. 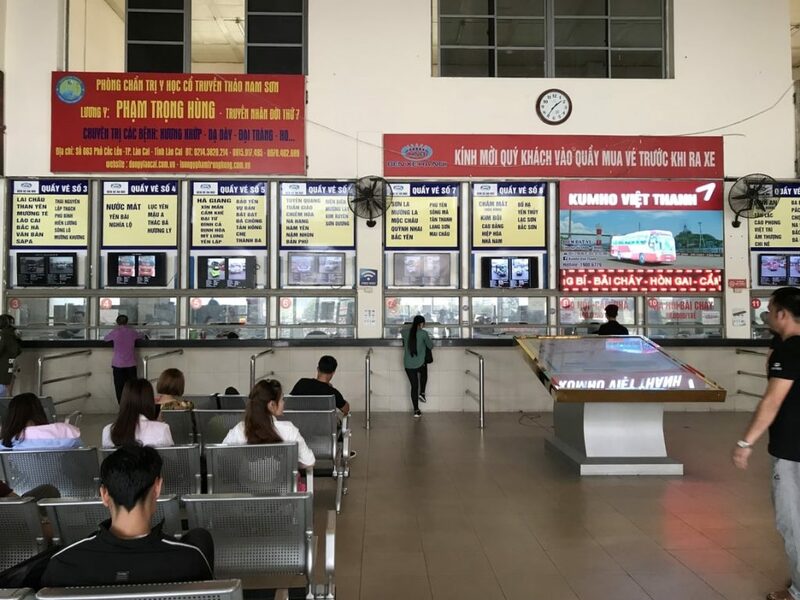 If you miss one of these, there are buses to Hoa Binh that leave Hanoi every 15 minutes between 06:00 and 18:00 (about 50,000 VND) and from Hoa Binh bus station there are regular buses to Mai Chau. Because there isn’t a bus station, you will get off the bus at the side of the road in Mai Chau. From Mai Chau town it’s a short walk (takes no more than fifteen minutes) or, if you prefer, 20,000 VND on a motorbike taxi to the villages. So you now have your ticket from Hanoi to Mai Chau. Let’s say you choose the budget option like us. I’m guessing that if you are going to Mai Chau you are a traveller and travellers like us are always looking for ways to save money. Taking The Bus From Hanoi To Mai Chau. What You Can Expect. It’s not rocket science. Don’t worry, it is actually very easy to get the bus to Mai Chau but like everything, it’s always nice to be pre-warned about a few things beforehand. The bus is more like an oversized car that seats 28 people. There are two seats on the left, a corridor and a single seat on the right. All seems reasonable until more people clamber aboard with big bags, and you start to worry that they will be sitting on your knee. Not to worry. A little fold-out seat goes into the aisle between each row of seats. You have all been squashed like sardines into rows and the one in the middle has no headrest. No matter you think. Just smile and try and remember how much money you have saved. The trunk of the bus is filled with boxes of chickens (yes, really) and what looks like a few UPS boxes. This bus apparently doubles as the local mail van. The boy who works on the bus alongside the driver will kindly try and ram your bags on top of the chickens. When it is quite obvious they are not going to fit he will insist that the passengers budge over and he will throw them on the back parcel shelf. Obscuring all rear view for the driver. It’s cheap. Get on board. The bus will stop once after about half an hour. You can get some snacks and go to the bathroom. I suggest bringing snacks with you. Don’t ask me where you are going to put them, just bring them. If you are inclined to hunger and boredom. They will rip you off at the service stop. My son was charged 100,000 VND for three packets of crisps and a small bag of oranges. That’s more than the ticket! Bring your own snacks. This one is important – so listen. The conductor – who is usually a teenage boy – will come around the bus asking for more money for the bags. He will say that they are oversized and that you need to pay more. Firmly say no. 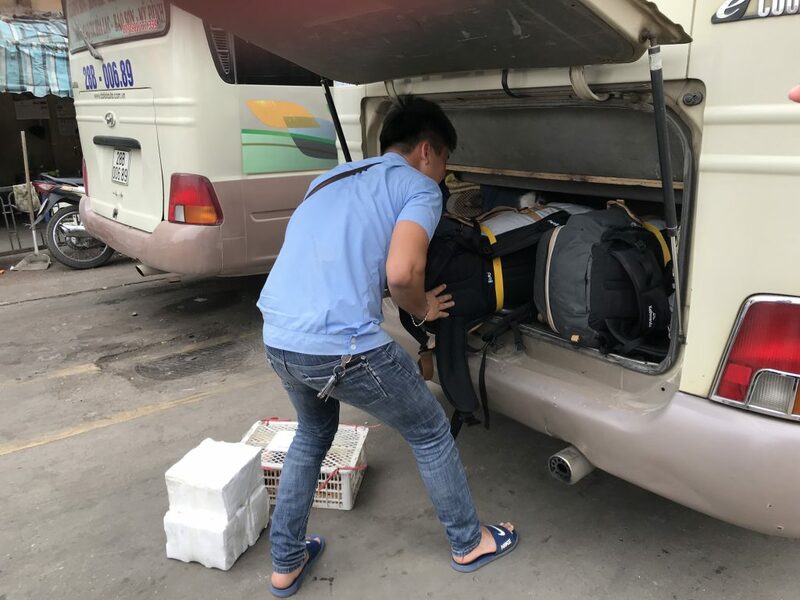 After quickly googling on my phone at the back of the bus I learned that this is apparently a scam that the Vietnamese will try on often. 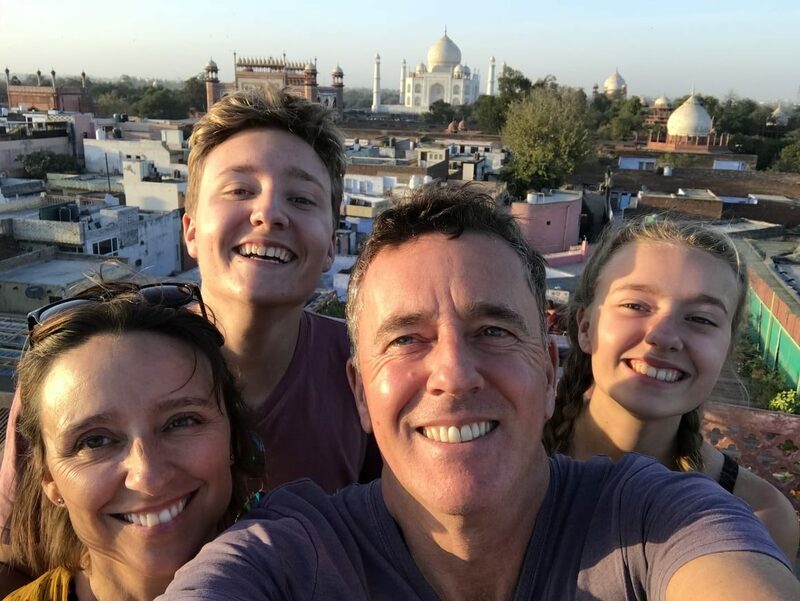 We have just spent six weeks in India. I am quite aware of scams. When I flatly refused to pay any more, he just shrugged his shoulders and went away. Don’t pay any more. There is no bus station on Mai Chau. Instead, the bus will drop you off at the side of the road. Don’t worry. There is only one way to all of the homesteads. You cant get lost. Show the address of your homestay to the driver’s helper, and he will point you in the right direction. And That’s it. A bit of a squeeze but think of the money you are saving! The conductor will continuously try and move you around to fit more cargo onboard. Move over chickens. This is where your backpacks will go. If not here then on the back seat. Go to the window that says Mai Chau and ask for a ticket. Speak to the staff behind the counter and not the ‘helpers’ that will be looking over your shoulder trying to sell you inflated price tickets. So that you know. This is what a ticket looks like. Show this to the conductor if he tries to ask for more money for the bags. Don’t pay any more! I almost stopped writing this post right now. 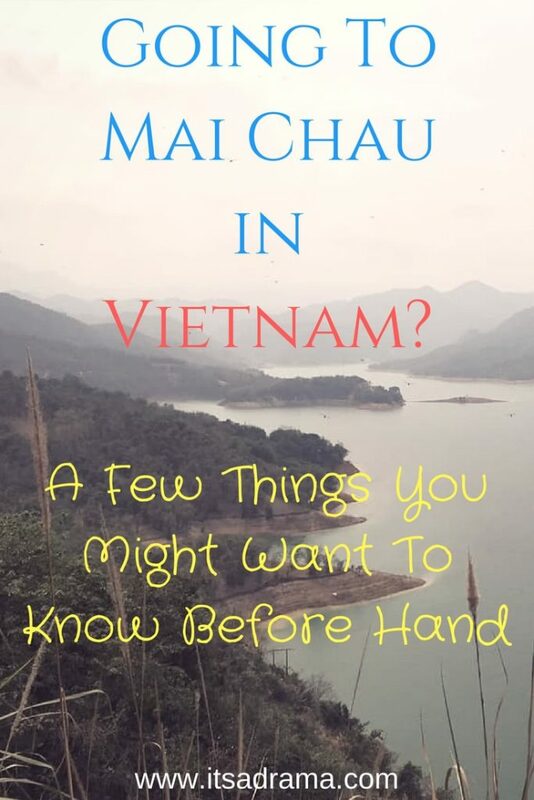 I have given you the information you need to get from Hanoi to Mai Chau; I could quite easily have gone to bed and left you to discover what I found out by yourself. But I’m kind. Sort of. I just wanted you to know what you can expect in Mai Chau. That’s all. If you are looking for places to stay in Mai Chau then you can use the handy map below to compare prices! ENJOYING THIS POST? PIN IT! We knew nothing about Mai Chau before we travelled here. I hadn’t read any blogs nor watched any vlogs. I expected it to be a sleepy little Vietnamese village with a few cows and lots of roosters. Somewhere where I could spend a few days unwinding after being in Hanoi. And it is, don’t get me wrong, it is beautiful. If you are staying in a homestay, then you will no doubt be staying in a stilt house in Lac Village. They are lovely and authentic. 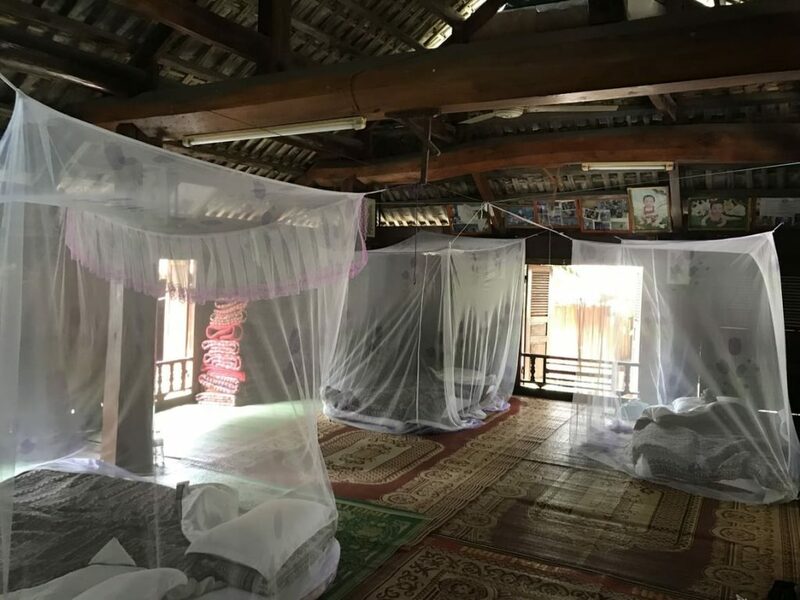 They have mosquito nets and thin futon beds to sleep on. Almost every single stilt house in the villages surrounding Mai Chau have tourist shops attached to them. These shops sell anything from the usual elephant printed trousers that I’ve seen since Sri Lanka, to weapons. Yes, weapons. If, like my 16-year-old son, you are a weapon fanatic or if you are just always on the lookout for authentic gifts, then you are going to love Mai Chau. There are some lovely artworks on sale and of course, the famous traditional style textiles. Nobody hassles you to buy anything. It’s all very low key. The stilt houses in Mai Chau are gorgeous. They are clean and very romantic. Unless you are like us who has two kids! Meals at the homestays seem to be the same all over the village. 100,000 VND per person. For that, you get a mixture of small homecooked dishes. We stayed at a traditional homestay. The food was lovely and tasty and you could help yourself to beer from the fridge. (15,000 VND). 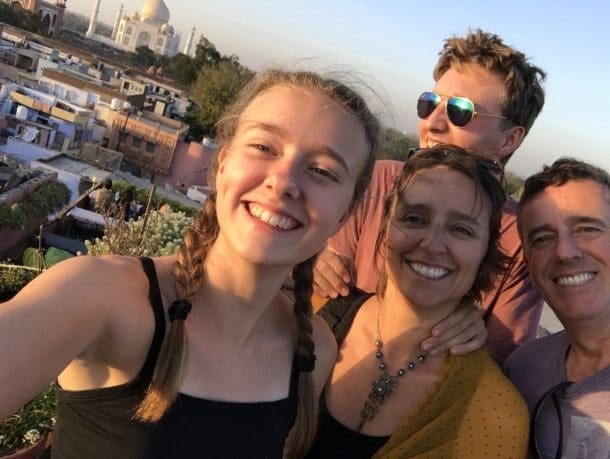 If you want to stay in the same homestay as us (the one in the photo above) then you can book it here. It was absolutely lovely and the owners were kind and excellent cooks. They helped us with everything we needed to know. Just make sure you bring enough cash. USD or VND the folks of Mai Chau will take either. There is an ATM, but annoyingly, like a lot of ATMs in Vietnam, it will only give you a maximum of two million VND. Get your money from the Shinhan Bank ATM in Le Thai To Street in Hanoi. (It’s opposite the Ho Hoan Kien Lake). 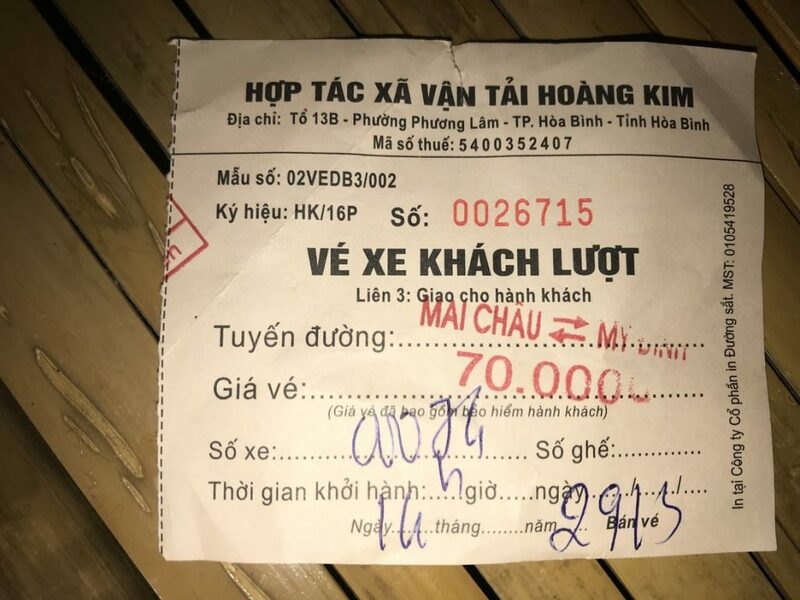 You can get three million out, and the service charge is the lowest we’ve seen in Vietnam. There are lots and lots and lots of cockerels. I love them, and I love the noise they make. Even very early in the morning. What I don’t love is cockfighting. Be warned that this sport is practised in Mai Chau. I didn’t know and was a bit shocked. Mai Chau is a beautiful, sleepy, and quiet Vietnamese town surrounded by even more somnolent villages. It is the perfect place to explore by foot, bike or moped. There aren’t masses of things to do in Mai Chau for kids, but in saying that my two loved exploring with their bikes and wandering around the markets. The food isn’t great, certainly not the best I’ve tasted in Vietnam but it is authentic. If you are feeling energetic and would like to explore Mai Chau by bike then you could always book a guided tour. This tour lasts for two days and in my opinion, is fantastic value as at $70 per person includes the transport from Hanoi to Mai Chau, a nights accommodation (in a stilt house) and a day touring Mai Chau by bike. You can check availability for this tour here. Watch Our Video Of Us Spending Time In Mai Chau! Mai Chau at the weekends is full of Vietnamese teenagers. Youth groups, high schools, music club, whatever. Just lots and lots of teenagers. And they are ROWDY. And they LOVE karaoke. If you are going to visit Mai Chau and you don’t want to have your eardrums blown out or be unable to hold a conversation over a glass of beer between the hours of 5 pm and 11 pm, then I suggest you don’t come at the weekend. Friday and Saturday nights are awful. Honestly, really bad. Vietnam scams. A few to watch out for. Staying in a stilt house in Mai Chau. What it looks like. 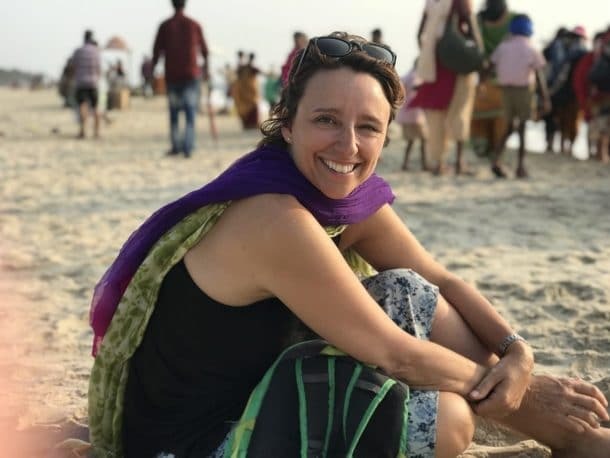 How do people on a regular wage afford to travel the world? 8 travel tips you can safely ignore because they are crap! You have two options if you do decide to travel from Hanoi to Mai Chau at the weekend. Get some extremely good travel earplugs or else get very drunk and join in. If you choose this option, I suggest you print off the lyrics to the Birdie Song. You’re going to need them. Have you been to Mai Chau? What was your experience? Leave me a message below or come and join our facebook group and have a chat! It was me that was humming along! I was even tempted to get up and do the chicken flapping arm action! Hi! Thank you so much for this detailed blog- it was honestly the most helpful thing about the area that I could find on the net! Where did you go after this? Or in other words, what is the local transport like in Mai Chau? Are you able to continue on to other cities or do you have to return to Hanoi? What route did you take leaving? I can’t find a single piece of info about transport from Mai Chau! Thanks so much! Is phong nah near mai chau? Thank you so much for all the information you posted. Hi! We went to Phong Nah after Mai Chau but it’s quite a way. You have to get the bus back to Hanoi and then get a train to Phong Nah. It’s beautiful there though so it is worth the effort! Hi Liz, thank you very much for taking the time and making the effort on putting down the details. You made travel to Mai Chau vivid, clear and detailed. We’ll be using this blog for our trip to Mai Chau in a couple of days. I have a question. Do we need to buy the bus tickets in advance or can we just buy it on the day of travel? Very very helpful! I was just looking to go on Saturday before Sapa, but I think now I will do it on my way back instead to avoid the weekend! So glad it was helpful Samantha! Have a wonderful time in Mai Chau and enjoy the peace and quiet! Great article, very useful for people preparing their trip!